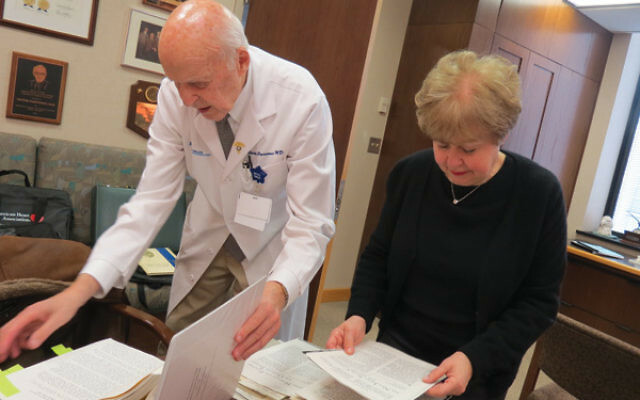 Victor Parsonnet and Linda Forgosh, executive director of the Jewish Historical Society of NJ, examine some of the Newark Beth Israel Hospital documents he donated to the JHS archives in March 2015. 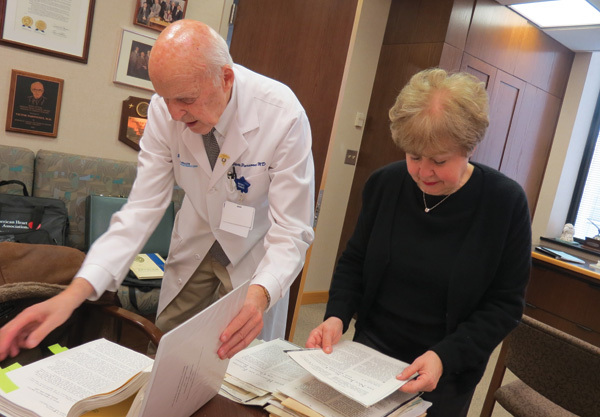 Sixty-six years after he began his internship at what was then called Newark Beth Israel Hospital, Dr. Victor Parsonnet officially retired as chief of surgery at “the Beth” as of Oct. 5, leaving a legacy of pioneering procedures that saved hundreds if not thousands of lives. A major player in local Jewish philanthropy and in the cultural world of Newark and beyond, Parsonnet has benefited the Jewish Community Foundation of Greater MetroWest NJ, is a board member of the Jewish Historical Society of New Jersey, and served as the link between the New Jersey Symphony Orchestra — of which he is chair emeritus — and UJA, the fund-raising arm of Jewish Federation of Greater MetroWest NJ. As a major supporter of both causes, he, along with his late wife, Mia, was among the original and continuing benefactors of the annual UJA of Greater MetroWest Benefit Concert at the NJ Performing Arts Center in Newark, which ended its 18-year run in 2015. For most of his medical career, Parsonnet was a heart surgeon who often made history in the operating room. He performed New Jersey’s first coronary bypass surgery as well as the first heart and kidney bypass procedures. In 1961 he was the first surgeon in New Jersey to install a pacemaker, the internal device used to jolt a malfunctioning heart. Then, in 1985, he experienced an “especially exciting moment” when he performed his first cardiac transplant and held another person's heart in his hands. In more recent years he helped develop the da Vinci surgical system, a robot that is used to insert probes through the abdomen or chest while a surgeon uses a remote control device from across the room. Born at his family’s summer home in Deal, Parsonnet was raised in Newark and graduated from Weequahic High School before attending Cornell University and New York University Medical School, with time out to serve in the Navy during World War II and the Air Force during the Korean conflict. There seemed little doubt that he would enter the “family business” begun by his grandfathers, Victor Parsonnet and Max Danzis, who were principals in building what is now Newark Beth Israel Medical Center in 1901. What began as a 21-bed hospital on the corner of West Kinney and High streets is today a state-of-the-art medical facility on Lyons Avenue that always made room for the Jewish and African-American physicians denied positions elsewhere. Outside of the hospital he is an avid tennis player, a pianist, and a patron of the arts, who devoted much time and philanthropy to the NJSO, whose chairmanship he held for 12 years. Parsonnet resides in Whitehouse Station with his wife, Jane. They have three children and five grandchildren.